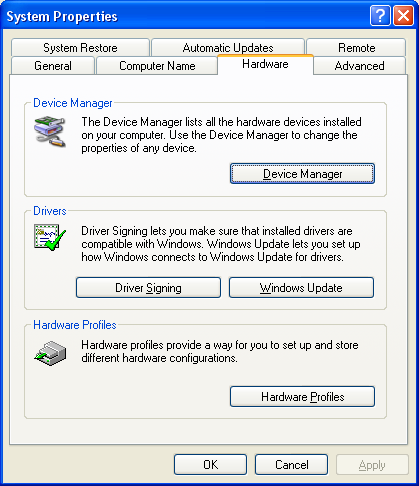 Device manager in Windows not only lists all the hardware devices connected to your computer, it can also be a handy diagnostic tool to use when troubleshooting a device problem. For example your sound on your computer might not be working and device manager is definitely a tool to help. You can even Fix a Hardware Problem Using Windows Device Manager so this tool is extremely handy. 1. Open the run box by pressing the Winkey and the letter R on your keyboard. 2. Type in devmgmt.msc and press Ok.
On the other hand you can open the device manager through the CMD window. 1. Open the run box as shown above or open the start menu to type into search. 2. Type in devmgmt.msc and press enter. 3. Device Manager will open on your screen somewhere and the CMD window will stay where it is. Also see how to open CMD in Windows 8. Windows Xp support has ended but some people still use this version. Press the Windows key and the Pause Break button at the same time. How easy is that? Then simply go to the hardware tab as shown below. There you will see the Device Manager button. In Windows XP you can open the control panel from the start menu and you will need to look for the system properties icon. On the hardware tab in the system properties you will see the device manager button. In Windows Vista and Seven you can also open the control panel from the start menu but the icon you are looking for is simply called system. (It is still the system properties but shortened) After that you can just click on the Device Manager link. Windows Key + X Launch the Power User Menu, providing many of the functions lost with the missing Start Menu, such as access to the Control Panel, System, Device Manager and Command Prompt. Windows Key + R Use this keyboard shortcut WINDOWS KEY+R to open Run dialog. Type devmgmt.msc and click OK.